Rutgers Institute for Ethical Leadership Conference July 25-26, 2016. Jack Hoban is a keynote speaker. Amnesty International requests investigation of BurlCo jail deaths - RGI's Jack Hoban weighs in in the Trentonian. Jack Hoban was shaped by service in the U.S. Marine Corps, a life-changing epiphany at a Cold War bar, and mentorship under two masters: The 34th generation grandmaster of the shadowy art of the Ninja and a sage of the Natural Law who may just have deciphered the meaning of life. He now delivers a revolutionary view of moral values for our time epitomized by the Ethical Warrior - protector of self and others as equal human beings. Hoban's methodology reaches from the Greek ancients to the counterinsurgency efforts of today's Marines to provide ethical clarity and confidence in our moral actions. Is there a "true north" on the moral compass? Is there an objective value that can be used to qualify our relative values as moral or immoral? How do we reject our tendency to dehumanize others not of our "in-group"- including our enemies - and respect true human equality? How do we do "the right thing" under the stresses of everyday life? 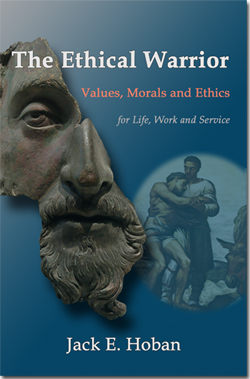 Published by RGI Media and Publications, the Ethical Warrior is available for $14.99. Review copies are available by request. Click HERE to purchase. Click HERE for a longer introduction to the book. More videos and books here.